Pentax is a Japanese camera maker, founded in 1919. The company that would become Pentax was founded in 1919 as Asahi Kōgaku Kōgyō G.K. (旭光学工業㈾). It was originally an optical company, beginning by making glasses under the Aoco brand (presumably the acronym of Asahi Optical Company), and made its first Aoco v projection lens in 1923. It began to produce camera lenses in the early 1930s, under the management of the CEO Kajiwara Kumao (梶原熊雄) and his closest collaborator Matsumoto Saburō (松本三郎). These lenses were not marked as made by Asahi, and were produced for various camera models made by other makers. From 1933, the company produced Optor and meniscus achromat lenses designed at Rokuoh-sha for Konishiroku models. 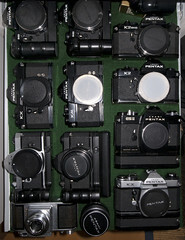 From the mid-1930s to the end of World War II, the company was also the main supplier of Molta, then Chiyoda Kōgaku Seikō (predecessors of Minolta), whose cameras were equipped with Coronar and Promar lenses. The company changed status in 1938, becoming Asahi Kōgaku Kōgyō K.K. (旭光学工業㈱) or Asahi Optical Co. based in Tokyo. It would keep this name until it became Pentax Corporation (ペンタックス㈱) in 2002. Pentax merged with the Hoya Corporation, the process was completed on 1 October 2007, the new name was Hoya Pentax HD Corporation (HOYAペンタックスHD㈱). Subsequently, Hoya has sold the Pentax camera division to Ricoh on 1 July 2011. The Pentax Imaging Systems Division was spun out as a new company and its shares transferred to Ricoh on 1 October. The deal also included the Pentax camera manufacturing subsidiary in Vietnam. A public announcement from Hoya explained that Ricoh is looking to build a consumer cameras business and wanted Pentax's interchangeable lens camera technology, lens technology and sales channels. Its plans for the business specifically include the interchangeable lens camera market. Hoya retained the other Pentax businesses, such as medical devices, that it acquired in its 2007 takeover. Terms of the deal were not disclosed but Japanese business paper Nikkei Business Daily reported price of about 10 billion yen ($124.2 million). The first camera produced by Asahi was the Asahiflex, that was also the first Japanese 35mm SLR, made as a prototype in 1951 and released in 1952. One of the models of the Asahiflex series, the Asahiflex IIb, was the first 35mm SLR to have an instant-return mirror, thus solving the problem of mirror blackout which had plagued SLRs up to that time (early SLRs left the mirror in its "up" position until the camera was wound for the next shot, blacking out the viewfinder). Pentax was originally the name of another 35 mm SLR camera model, introduced in 1957 and successor of the Asahiflex. The name is derived from the shape of the prism used in SLR cameras (pentaprism), and the ending deliberately looks like the Zeiss Ikon Contax. In fact, the name Pentax was a property of Zeiss Ikon until they sold it to Asahi Optical Co. Many Pentax cameras were sold stamped with the name "Honeywell". Actually Honeywell was only a distributor, and these cameras were exactly the same as the ones stamped with the Asahi name. Not all examples of the cameras listed below have Asahi lenses. The Heliostar lenses were perhaps assembled by Asahi (see the discussion there). ↑ Yazawa, p. 12 of Camera Collectors' News no. 247. ↑ The Coronar and Promar lenses are attributed to Asahi in various sources, and this attribution is confirmed by the "Kokusan shashinki no genjōchōsa" ("Inquiry into Japanese cameras"), lens items Lb5, Lb39, Lc9 and N2. ↑ Its address in 1943 was Tōkyō-to Itabashi-ku Itabashi-chō (東京都板橋区板橋町). Source: "Kokusan shashinki no genjōchōsa" ("Inquiry into Japanese cameras"). ↑ Japanese version of the news release found in the Hoya official website. The name "HOYA PENTAX HD Corporation" is written in capital letters. Listing of most Pentax film camera manuals in English PDF format and a few HTML versions that can be translated. Asahi/Pentax Cameras Price Guide ~ Compiled prices from recent completed auctions. Asahi Pentax Spotmatic at Classic Cameras by RaúlM.